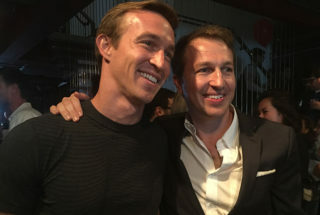 Nick Melvoin, right, and his brother Charlie Melvoin on election night. In his first interview after declaring victory in the LA Unified school board election, Nick Melvoin vowed to protect parents’ choices in education and to move the district beyond the charter school versus traditional school narrative. “I would like the first thing we try to tackle to be moving beyond this what we call the school, who governs the school and respect parents’ choices and respect educators’ choices,” he said soon after his acceptance speech Tuesday night as he paused from greeting supporters to talk to LA School Report. Melvoin delivered an upset victory in Tuesday’s election, unseating a school board president, something that hasn’t happened in at least two decades. Together with Kelly Gonez who won in District 6, they will be part of the strongest reform majority that the board has seen. Melvoin defeated Steve Zimmer in the District 4 race with about 57 percent of the vote, according to unofficial results. Other top priorities include a unified enrollment system and transparency in the district’s finances and facilities. He said he would work to reform the co-location process in which charter schools share campus space with traditional schools. He also wants to push for more autonomies for district schools like those granted to charter schools. Melvoin’s brief acceptance speech didn’t include charters, but in the interview afterward he professed his support for independent charter schools, which are publicly funded and run by nonprofit organizations. LA has more charter schools than any other district in the nation, with about 16 percent of LA schoolchildren enrolled in independent charters. Melvoin had the backing of deep-pocketed philanthropists who have supported charter school growth, including Reed Hastings, the CEO of Netflix, Eli Broad, and former LA Mayor Richard Riordan. About 400 people attended Melvoin’s election night party at a home in Venice where supporters played ping-pong and foosball and snacked on popcorn. The packed crowd skewed young. Melvoin is 31 years old. Former LA Mayor Antonio Villaraigosa, who is running for governor, attended as well as Marshall Tuck, who is running for state superintendent. There were also a large group of LA Unified moms, whom Melvoin thanked for their dedication to his campaign Tuesday night and acknowledged to reporters their help in securing his victory. He said many of the moms were participating in an election for the first time. “Once you awaken that sleeping giant, it’s not going to go back to sleep,” he said to cheers. Melvoin also said he hopes the opposing forces in the election can coalesce around issues like pension reform, a parcel tax, and fighting Trump administration policies. The bitter campaign was marked by negative ads and record outside spending, with the local teacher union targeting Melvoin. UTLA spent close to $2.3 million to oppose Melvoin and elect Zimmer, according to reported spending. Tuesday night was a major loss for the teacher union, which has been declining in membership and raised dues to fill its war chest to prepare for the election. Money from national unions also came in. Melvoin said he will reach out to UTLA President Alex Caputo-Pearl, who campaigned vigorously for Zimmer. Throughout the campaign, Melvoin has said he respects Zimmer. Melvoin started his election night speech by thanking the two-term board member for his service. The expensive race was hard fought with lots of mudslinging between outside groups through dozens of mailers and TV and digital ads. Zimmer was the biggest target of the negative ads. Zimmer’s supporters tried to align Melvoin with the “Trump/DeVos agenda,” although Melvoin is a Democrat and has denounced Trump’s education policies. Bill Burton, a former deputy White House press secretary in the Obama Administration and Melvoin’s campaign strategist, characterized the race as change versus the status quo. Max Arias, the president of SEIU Local 99, said in a statement Wednesday morning that he was disappointed Zimmer did not win but congratulated Melvoin. Villaraigosa, who worked to elect reform-friendly school board candidates when he was mayor, said in an interview that he believes Melvoin will guide the district toward its goal of 100 percent graduation at a more accelerated pace. Tuck, who is also endorsed by education reformers, said the election results showed that voters wanted better leadership. “I think it’s a mandate for big change in the district and a mandate that people want to see the board actually take on some of the tougher challenges head on and that want to see more unity around whatever it takes for our kids and want to see an accelerated pace of change in our district,” he said. Ben Austin, who founded Parent Revolution and worked on an independent expenditure committee supporting Melvoin, said Melvoin’s and Gonez’s wins will result in the strongest reform majority the board has ever had. He said the difference in this campaign from how reformers ran in the past is that it was a grassroots effort that included parents of children who attend traditional schools as well. He said a new narrative emerged with the best interests of kids on one side and the interests of downtown district bureaucracy on the other. “It resonated with parents,” Austin said. Katie Braude, executive director of Speak UP, a parent organization founded to improve public education in California, congratulated Melvoin in a statement Wednesday afternoon, noting that its members worked overtime to organize parents and get out the vote. “This grassroots movement of parents is the untold story of this election,” Braude said. *Updated with Speak UP’s statement.